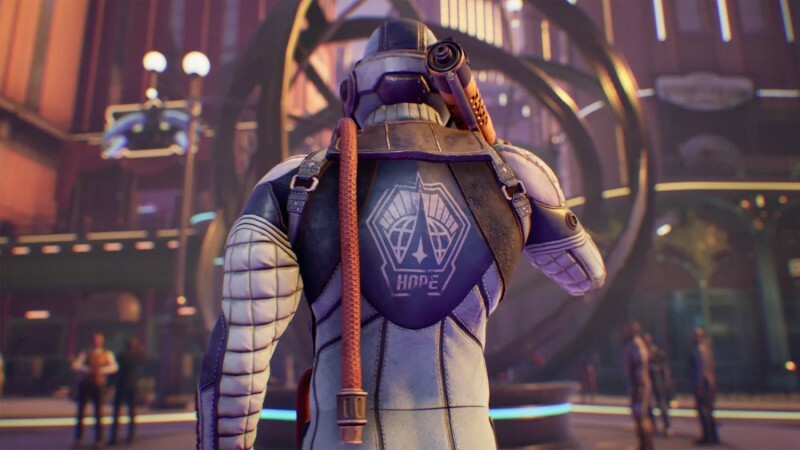 Last month, we gave you tons of exclusive content about Obsidian’s fabulous-looking RPG The Outer Worlds, including a video that showed off gameplay. Now, even more gameplay footage is surfacing online, coming from a demo that was presented by Obsidian during PAX East. The video, recorded by YouTuber MrRedRivers, gives a look at tons of combat and an area called Byzantium, the city of the elite. The protagonist travels there to take part of a propaganda film shoot. While voice acting for this section hasn’t been implemented yet, the written dialogue still looks pretty amusing. It also demonstrates a glowing baton that slows down enemies and eventually freezes them, all while strangely rearranging foes’ faces such as enlarging or shrinking heads. Obsidian jokes that this was the result of a bug during development, but they kept it in because of its hilarious effects. Check out all of our exclusive interviews, features, and videos from last month when we visited Obsidian for our cover story by clicking the banner below.